If you were a child of the 80s in the UK, then there’s a particular advert that will no doubt bring you right back in time. It’s one of those iconic ads that you just associate with the product, If I said to you it involved a kid running around with a (then state of the art special effects) glow around him, could you name the product? Ready Brek, of course. Eat the warmed porridge and get all fired up; head out into the cold; and your glow will go with you wherever you go. On Thursday night in the sky there was another glow, periodically surrounding the Moon. This time, however, its cause was ice, not fire. The skies above Northern Ireland last night were quite clear, with only some broken low altostratus cloud filtering in on occasion. But, for a time, they were joined by a thin veil of high cloud - cirrostratus. So thin and wispy that the light from the Moon and stars could still easily shine through. But not so weak and helpless that they didn’t refract some of that light on the way past. Day time 22 ° halo around the Sun - note the rainbow colours. Cirrostratus clouds can produce a range of atmospheric optical effects and halos. During the day, these optics can be visible with slight but very recognisable colours - although it's clear you are not looking at a rainbow as the features are the wrong shape in the wrong part of the sky. Given the fact that they are suspended high in the sky there's definitely no chance of this Irish man finding a little persons with a life changing pot of gold in his possession. The first time I photographed a halo, the rainbow colours were clearly visible and inevitably the old mnemonic about the vanity of a certain king's military exploits popped into my head as I singled out the colours one by one. But if these halo features aren't rainbows, what causes them? They are similar to rainbows in that it's got to do with the refraction of light. But in this case, the light is being refracted through the ice crystals that the cirrostratus clouds are made up from. For the full circular halo to be formed, the ice crystals must be hexagonal in shape, like short unsharpened pencils. And this shape causes the light to be refracted through on average at 22° - hence this feature is known as a 22° halo. As the Moonlight heads towards us, some of it passes through the thin cloud directly. But, for the light that is refracted, it ends up having a different apparent source. If the observer traces the light back up into the night sky, it appears to come from a ring of a diameter of 22° away from the Moon. This is the Moon halo. The inner part of the halo is much more distinct, and the outer part fades out more into a fuzzy region. Inside the halo is also darker than outside. This is because light is not refracted at angles less than 22° and so there is no light refracted into the inner region, whilst light is refracted outside of this. The inner part of the halo may have a red tinge, fading through the colours of the rainbow until you get to the fuzzy blue zone at the outer edge of the halo. This is because the red light is refracted least, whilst blue light is refracted more. The colours other than red may be harder to make out as they tend to merge into each other quite a bit. The Moon and Aldebaran in close conjunction last night. Last night’s Moon halo wasn’t the only interesting thing to be seen in the night sky, though. As the Moon gets closer to aligning with the Earth for Monday morning’s lunar eclipse, it’s moving into the constellation of Taurus. That brought it very close to the star of Aldebaran last night (you may have noticed a star shining brightly, just to the bottom right of the Moon). Aldebaran is a red giant sun, some 65 light years away. It looks tiny beside our Moon; in reality, this huge stellar object shines over 150 times brighter than our Sun and is around 40 times the diameter. In fact, if you could photograph Alderbaran and our Sun in conjuction, our Sun would be about the size of Aldebaran in the image, and the Aldebaran would be the size of the Moon! Zoom out a bit, however, and you see some of the other wonders of the night sky getting in on the action. To the top right, there’s the star forming region Pleiades - the Seven Sisters - a collection of young, hot, blue stars and nebulae 444 light years away. Track down to the bottom left of the halo, and there’s Orion, sticking his head in to see what the craic is. Further down to the bottom left and it’s Sirius, the Dog Star, and the brightest star in our night sky. The 22° halos are most common with cirrostratus clouds as these tend to form a reasonably uniform milky coverage across the sky, allowing the unbroken circles to be formed. In folklore, they are often associated with unsettled weather approaching. This is actually based on some sound meteorology. The rising air associated with an approaching front at first can form cirrus and cirrostratus clouds, harbingers of coming frontal rain and blustery winds. And, sadly, in the case of Thursday night’s cloud, that was indeed the case as a depression brought cloud and rain over us on Friday. Maybe, given how cold and miserable it has become, a wee bowl of steaming Ready Brek would be just what’s needed before we venture out! As well as the 22 degree halo, as the lower cloud came and went on Thursday night, another feature was visible around the Moon - the lunar corona. Unlike halos, coronae are formed by defraction of light by water droplets in the lower cloud. But, like the halo, the light is separated out depending on wavelength. The central part of the corona - the aureole - is typically blue in the centre, giving way to reddish brown towards the edge. The colours here can be very vivid, especially on camera. 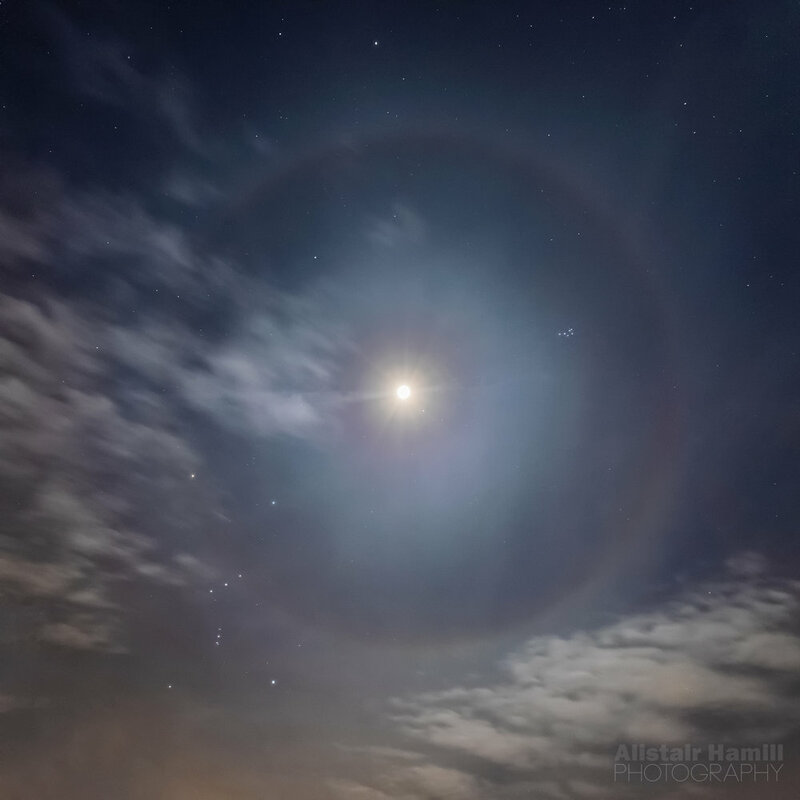 As the lower cloud came in and the halo faded, a lovely corona developed around the Moon. Just in time for a couple of swans to swim out majestically into the middle of the lake. One didn’t hang around too long - but the other one stayed put long enough for me to capture my very own version of a nocturnal swan lake! Partial 22 degree halo and a little bit of Orion getting in on the action again at the Copper Coast, Ireland. Check out a previous blog on other atmospheric optics here.